« What’s the Most Important Reason to Oppose Gun Control? Heck, just look at these three images – here, here, and here – and you’ll find startling evidence that politicians make the tax system worse with each passing year. But there is an office at the IRS that ostensibly exists to defend the interests of taxpayers. The Taxpayer Advocate Service, according to the government website, “an independent organization within the IRS and helps taxpayers resolve problems with the IRS and recommend changes that will prevent the problems.” The head of this office, Nina Olson, has the title of National Taxpayer Advocate. Among the other problems Olson identifies in the report are…the underfunding of the Internal Revenue Service… The IRS, which Olson compares to the accounts receivable department of a company, should be fenced off from more budget cuts by Congress, she writes in the report. But I want to be fair. Some of what the TAS does is worth applauding. The report also discusses the grotesque levels of complexity in the code. Here’s more of the Bloomberg story. The TAS also produced this very depressing infographic (click to enlarge). 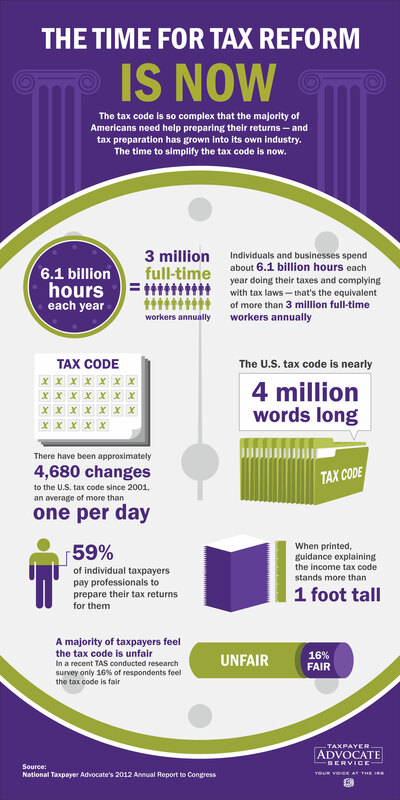 It’s absolutely disgraceful that complying with the tax code requires the equivalent of 3 million full-time workers. It’s a vast understatement to call this a counterproductive misallocation of labor. Or how about the fact that just the guidance for the income tax, when printed out, creates a stack of paper more than 12 inches high? And what about the nauseating little tidbit that the tax code has been changed more than once per day since 2001? No wonder it’s such a corrupt mess. Isn’t it time we rip up the entire tax code and put in place something simple and fair like a flat tax? Here’s my case for real tax reform. By the way, I’m also more than willing to replace the tax code with a national sales tax, perhaps something like the Fair Tax. I’m given speeches, testified to Congress, appeared on TV, and done all sorts of things to promote that idea. But the one huge caveat is that we need to make sure that the politicians don’t pull a bait and switch and stick us with both an income tax and national sales tax. Which is what happened in Europe when governments implemented the value-added tax without repealing income taxes. That’s why we would first need to get rid of the income tax and repeal the 16th Amendment. But then, because I don’t trust the Supreme Court (gee, I wonder why? ), I would also want to replace the 16th Amendment with new language that would be so ironclad that even Chief Justice John Roberts couldn’t fabricate reasons why an income tax could ever return to plague the nation. But since we can’t even get the votes to approve a watered-down balanced budget amendment, I’m not holding my breath for the day that the Constitution is amended to permanently kill the income tax. And that’s why I think the flat tax is a safer option. The worst thing that happens if we get a flat tax is that politicians change their mind and we degenerate back to the current system. The worst thing that happens if we get a national sales tax is that politicians “forget” to eliminate the income tax, we wind up with both, and become France. The tax code is so convoluted because business and lobbyists have poured so much money into the system in order to get this tax break or that one. Over the years it just continues to compound. Unfortunately also that same money which has made the tax code convoluted is going to fight against the elimination of income taxes because they benefit from the system. Additionally the tax preparation industry will fight tooth and nail to prevent its own destruction which is what would happen if the tax code were simplified. Finally the IRS will fight against a flat tax or sale tax system because it will take away funding from them. If income taxes are eliminated then the IRS is basically eliminated too. If a flat tax system is implemented then the IRS faces huge budget cuts. Either system would eliminate the need for most of the IRS staff because it would be so much easier to process and evaluate tax returns. Just like everything else it is all about money and the money isn’t on the side of flat taxes or federal sales tax. Is there any hope that we could go back to a pre-16th amendment Constitutional Apportioned tax? Basically make the States get creative and collect all the taxes? Apportioned taxation doesn’t inherently mean smaller or more fair, but it could mean competition amongst the States.